Why Choose Us As Your Part Time Cleaning Company? If you have a carpet in your home or office, it is important to use carpet cleaning services to prevent it from accumulating an unthinkable amount of dirt particles, dust as well as a myriad of mites and other microorganism such as bacteria. Some people have the wrong misconception of thinking that a carpet needs to be cleaned only when it is heavily soiled or badly stained. On the contrary, it is very important to have the carpet cleaned occasionally by professional carpet company to avoid a situation where family members may start suffering from allergies and other diseases caused by the dust and dirt from it. 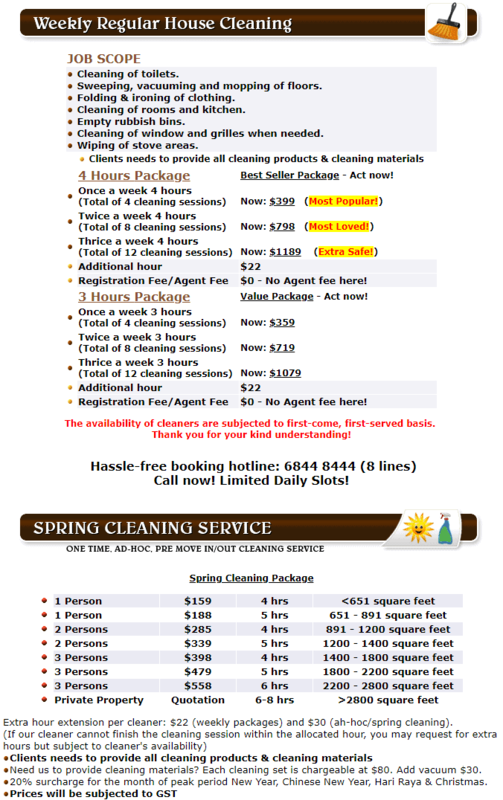 If you are Singapore resident, our part time cleaning service will be perfect if you want to have your carpet cleaned. We have carpet cleaning machines that make the process so easy – just like vacuuming – and we make sure that the carpet is cleaned to your satisfaction. The cleaning machines have been specially designed to clean the carpet with relative ease as well as maneuverability so that no spot or dirt will be left on it. You are going to notice a real difference in the brightness of the texture as well as color of the pile. It is very important to hire a part time cleaner to have your carpet cleaned. Otherwise, if you neglect it, it might end up having weight that could add up to four times its own weight with a lot of it being dirt. Even though you might argue that you always have your carpet vacuumed from time to time, if you want it to be totally clean, you will need to have it properly cleaned, shampooed, steam cleaned and washed. Vacuuming is only going to take off the top layer of dirt. It does not remove the lower layer and as the dirt, grit and grease trod deeper and deeper, it cuts the pile making the carpet dull with lose fibers. With our carpet cleaning services, your carpet will be able to undergo a deep water extraction to remove all that dirt that remains deep down even after it has been vacuumed. If you have a camera that you can use to magnify the carpet, you will see that after vacuuming it, surface dirt will be removed but there will still be a lot still buried deep down. Deep water extraction not only removes the pile of dirt that has accumulated deep down the carpet, but it also restores the color of the carpet. The carpet also becomes soft and springy all the way down to the backing. Some people have been made to believe that cleaning carpets (especially woolen ones) is not a good practice. This is totally not true. In fact, it is recommended to have the carpet cleaned regularly if you want it to last for long. Regular cleaning of the carpet is also going to help remove trapped odors as well as germs that may cause discomfort in your house. When the carpet is washed with deep water extraction, its fibers are washed without making the backing wet. This implies that the carpet is not going to shrink and it will be dry enough to walk on within a very short time. We are a part time cleaning company that has gained popularity in Singapore for the services that we offer. We are the company to choose if you are looking for reliable as well as professional housekeeping service. The sooner you remove the dirt and stains from your carpet, the safer you are going to be in your house against potential harmful microorganisms and as a result you will be promoting healthier indoor living. It is not necessary for the cleaning process to be obtrusive though. You can have your floor deep cleaned and sanitized without having to inject shampoo and water that make it wet and therefore not walkable for quite some time. When your carpet is cleaned without water and shampoo, it means that it will not need additional drying time after it has been cleaned. The carpet remains dry before it is cleaned and after it has been cleaned. In this process, chemical safe cleaning products are used in order to clean the carpet thoroughly and get rid of microorganisms such as mold, dust, mites and fungi. The results will depend on the type as well as the condition of the carpet. But if you want it to look superb all the time, regular cleaning will need to be observed. We can also deploy a part time maid to come and help you with the helpful tips for cleaning the carpet if you are a do-it-yourself kind of person. But we strongly recommend that you use a professional service that will use carpet cleaning machines that will leave you with total satisfaction. If you decide to do it on your own, it is important for you to study the various cleaning methods in the market and decide on the one that is going to be more suitable. But you do not even have to worry about this since our part time carpet cleaning maid will be fully equipped with this information and they will advise you accordingly. If you come from Singapore, we strongly recommend that you come to us for your carpet cleaning needs because we provide the best quotes and offer the best services. We focus on effectively producing the intended results to leave you totally satisfied. When you contact us, we will require to do an onsite assessment to determine the condition of the carpet as well as the floor area. This way, we will be able to know the kind of cleaning products as well as the technology that will be perfect for your carpet. All the staff at our company have embraced the core values that guide us as a company and therefore you will get the best service even if you are hiring a part time maid from us. We make sure that we part on a pleasant note and leave you totally satisfied with the work we did.